Four figures from my collection of soldiers from the Peninsular war : three British and one French. 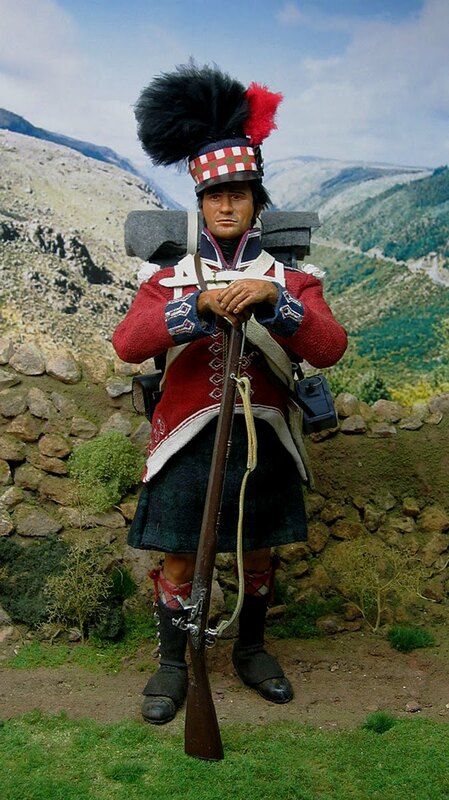 A Highland soldier of the famous Black Watch, in Spain in 1813. Again this is a reworking of a commercial figure from DiD/ML, with many detail improvements to bring it to a better level of historical accuracy. The bonnet is new, made as per the original from a pork-pie shaped knitted bonnet mounted with ostrich feathers. It has a leather peak. 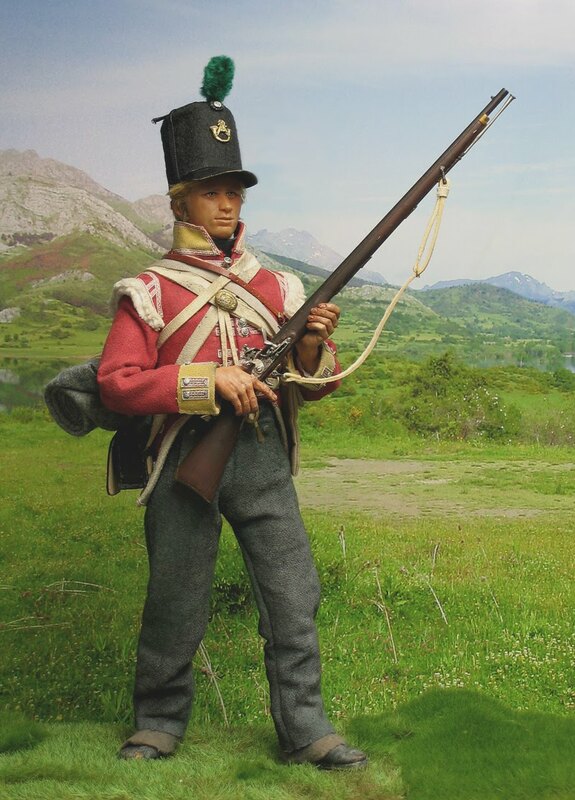 I have built all the equipment from buff leather, replaced the waterbottle and haversack with items of the correct scale, and given him one of my India Pattern resin muskets ( see Catalogue ). 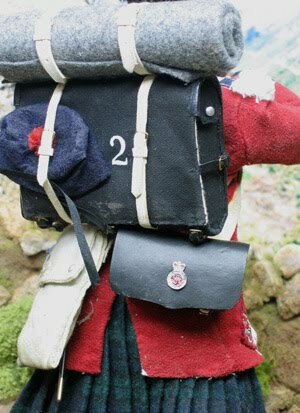 This rear view shows the canvas knapsack with the blanket rolled on top and undress bonnet stuffed into the straps , and the unique badge worn on the 60-round pouch. Under campaign conditions much of this finery had to be abandoned , and Highland soldiers often had to wear trousers and leave their feathers in store . On the right you can clearly see the construction of the bonnet : a knitted porkpie , mounted with feathers , a diced band ,a cockade with the red hackle, and a peak. 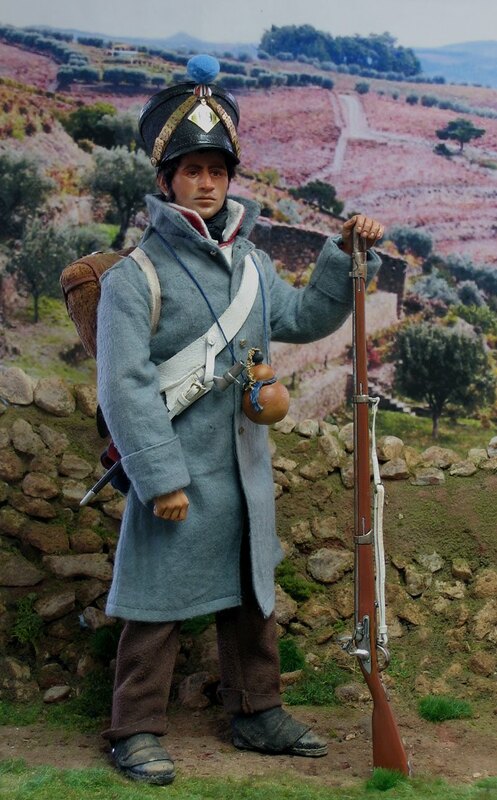 Private , 85th Light Infantry , 1813. The Light Infantry in the British Army at this period were a new invention, or perhaps a re-invention. After suffering at the hands of French skirmishers in 1799 , experiments in training troops in skirmishing , oupost duties and sharpshooting led to the designation of seven Line Regiments as Light Infantry. Amongst them were the 85th ( Bucks Volunteers ) , in some ways an unfortunate regiment. Raised in 1778, it seved in the West Indies, with the usual appalling loss of life to disease ; then lost more in storms on their return to Britain. Reformed in 1794 on the Duke of Buckingham's estates ( hence the name ) it served in the Flanders campaign of 1799, Madeira , then Jamaica again. Returning to England in 1808, it was reformed and retrained again as a Light Infantry corps, then sent to Walcheren , where it suffered appallingly from malaria as a result. There was then a frightful row amongst the officers, which eventually resulted in all of them being reposted, and the whole lot replaced with new. 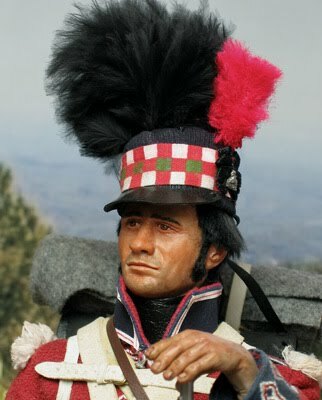 Finally in a fit state to be employed again , it served in northern Spain and the Pyrenees campaign of 1813-14. The Light Infantry soldier is very like his Line counterpart , the only distinctions being quite minor. He wears a buglehorn shako badge rather than the plate of the Line ; has smaller buttons and a green plume. The musket is a special one : the New Land Pattern Light Infantry musket, designed with a backsight and a fancy trigger guard. He uses a slightly different drill , based round the need to operate in Open Order , in pairs, as a skirmisher, maintaining a rapid but accurate fire in front of the main line. He wears light order, without the knapsack , but with a blanket rolled in straps on his back. The 85th also took part in the American War of 1812, being part of the raiding force which captured Washington and burnt the White House. It was then at the disastrous battle of New Orleans, where it suffered heavy casualties but acquitted itself very well , withdrawing in good order. The bulk of a French Infantry battalion , four companies out of six , consisted of Fusiliers , the lowest grade of soldier. Conscription had been introduced since the Revolution , and the social mix in a French battalion was much greater than in a British one. Unless you could buy a substitute, all unmarried young men were liable to end up in the army : Bonaparte's appetite for soldiers was insatiable . Their equipment was very basic : a plain shako, a blue coat, waistcoat and trousers, and some economy model accoutrements. There were often shortages , particularly in Spain , where the supply lines back to France were problematic to say the least. Much use was made of local supplies of brown cloth , as in the trousers here. The greatcoat was much worn : often shoddy , and a wide range of shades , it served both as coat and bed, and was often worn in preference to the tunic, a French military habit that lasted well into the 20th century. Their lot was unenviable : always forced to live off the country, dispersal to forage often meant murder by the Spanish , and concentration for battle often meant very short rations. They beat the Spanish armies repeatedly, but that implacable people would not submit ; and the French Generals never quite found a tactical answer to Wellington's Anglo-Portugese army. He has a gourd round his neck , probably containing local wine.